"Drehzahlmesser, Serie: Z-Series 3-3/8″ ins Armaturenbrett integriert elektrisch"
In-Dash Electronic , 3 3/8 in. 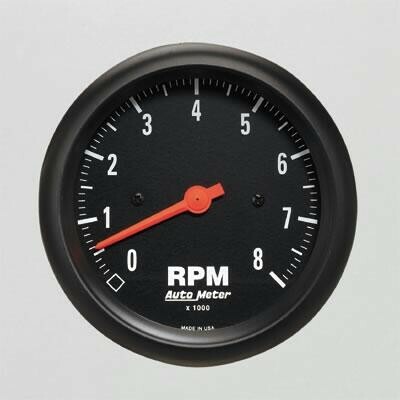 A tachometer for performance people. Auto Meter Z-series street tachometers are the perfect bolt-ons for monitoring any high-powered engine. These tachometers have a black face and bezel, white digits, and a fluorescent red pointer. They come with an air core meter movement for fast, accurate action and long-lasting durability. They're available in either 5,000 or 8,000 rpm readings.